Do you ever get a backlog of new crafty things you've just not got round to playing with? I know I do! These carved flower stamps have been waiting patiently for me to ink them up for quite some time now. The Pan Pastels are a more recent purchase but they've still had to wait a while - oops! It was fun to try them out in anger though (having previously only tested them on the back of an envelope the day they arrived!). elegant in real life but it was a swine to photograph - I hope you get the idea! I stamped the flowers on an old book page and added Diarylide Yellow and Orange Pan Pastels over the top, letting the yellow blend out past the flower outline to get a "glow". I used a green pencil for the calyx area. I then smeared a liberal amount of Turquoise and a little Ultramarine on the background. I really liked the way the pastels spread and the amount of pigment is very impressive - a little goes a very long way and those pots are going to last ages! The flowers looked pretty but I decided I'd like more definition so I used a stamp positioner and stamped again directly over the top of the original. If you planned to do this in advance I guess you could use a light coloured ink for the first stamping, just as a guide for where to spread your colour and then you wouldn't have to be quite as precise with the second impression. That Hero Arts sentiment gets another outing - I seem to be incapable of making a birthday card without it at the moment! This one's destined for my sister-in-law but she's not a blog browser so I think it's safe to show. The Pan Pastels UK challenge blog has an "anything goes" theme this week and since I remembered to look I'll hook this up there. loving the panpastels and the flower stamp. Love this card. Fabulous stamp. A stunning card, Joanne, it really does glow. And what a fantastic stamp! Oh I love these carved flower stamps that Godelieve has done for Darkroom Door - they are top of my wish list at the moment.I love the aura effect you've given the flowers - it's very effective. 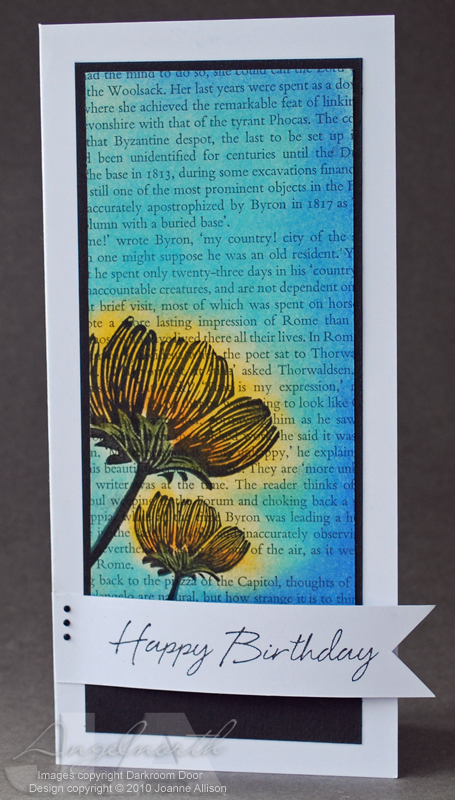 Love the flowers stamped on a bookpage. Great colors together! Great design, I never think of using old book pages I will have to go to my local charity shop and see what I can pick up. That's where all of my read books end up! Have just had a discussion with my daughter about not colouring ' in the lines' it's very nice to see something that works the way she described it. Having a grown up daughter who is interested in art makes for some lively discussions. A super card.